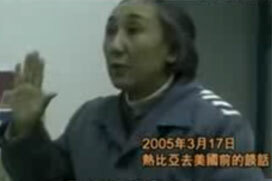 Police refute Rebiya Kadeer´s claim of "100 deaths in Kashgar"
"The deeper cause of Sunday´s riot in China´s far northwest Xinjiang, which left at least 156 dead, was ´six decades of Chinese rule, during which the Uyghurs have endured a litany of human rights abuses such as arbitrary detention, torture, discrimination, religious repression, forced abortion and removing Uighur language teaching from schools.´"
Truth: The tale of Kadeer, who spent 40 years in Xinjiang and was listed as the richest woman in Xinjiang and the eighth richest on the mainland by Forbes in 1995, is a rags-to-riches story. Truth: In Xinjiang, minority people hold more than half of government posts. About 360,000 government employees in Xinjiang are ethnic minorities. Truth: Rebiya Kadeer´s identity as a Uygur also allowed her to have six children while most of her Han counterparts were limited to one. Truth: Jume Tahir, 69, imam at the Id Kah Mosque, the biggest in Kashgar with a history of almost 600 years, said the government had invested 1.5 million yuan (219,500 U.S. dollars) to renovate the mosque in 1999. On March 11, 2005, Rebiya Kadeer went to the US on medical parole. Upon her release, she promised never to do anything that harms national interests. [July 1] The Congress held a special meeting, plotting to instigate unrest by sending messages via the Internet, telephones and mobile phones. [July 4] Some people inside the country began to send out a flood of online posts encouraging people to go to the Renmin Square in Urumqi, capital of the Xinjiang Uygur Autonomous Region, to protest on July 5 to support separatists abroad. [1:06 a.m. July 5] Police in Urumqi were tipped off that some people were putting out illegal information calling for an illegal gathering at Renmin Square at 7 p.m. July 5. [July 5] Kadeer said, as she called her younger brother in Urumqi, "A lot of things have happened, and we all know something might happen in Urumqi tomorrow night." [July 6] Kadeer held an emergency meeting with some senior members of the Congress to make plans to further stir up both domestic and overseas demonstrations and to call for intervention from foreign governments and human rights institutions. World Uyghur Congress, founed in April, 2004, in Munich, Germany, is a separatist group.